Champion of the cleaner home. Contains natural waxes and oils. For the care and protection of beautiful treasured possessions. 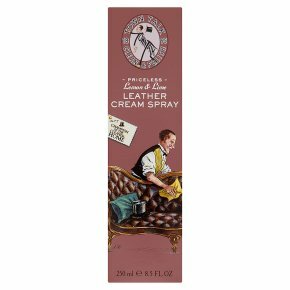 This product has not been tested on animals.When you're in a hurry and time is precious, this excellent Leather Cream Spray is priceless. Used sparingly, it will bring a lustrous sheen to leather shoes and luggage, including briefcases and handbags, as well as clothing and furniture. Its unique blend of lanolin, natural beeswax, carnauba wax, almond and castor oils, combined with the zestful scent of lemon and lime, not only helps prevent the leather from drying out, but can also revive its natural suppleness. Directions Always test on an inconspicuous area before use. Shake well before applying sparingly with a soft cloth. Allow to dry and then buff and polish with a clean, soft cloth. Mr Town Talk's Top Tip When storing your leather bag let it breathe, never store in a sealed container.